IHS Connect provides continuously updated analysis of general business conditions, economic information and general risk assessment for countries, continents and regions. Reports include political, economic, re gulatory/legal, tax, operational and security considerations. Interactive maps, statistical data, charts, and graphs analyze and present data on specific geographies. To get started, click the gear icon in the upper right corner of the page and choose Show Subscribed Content to limit search results to Bentley’s subscription content. A basic search box for keyword searching is provided to the left of the gear icon; start typing a search term and a list of suggested topics appears below the search box. Results will be provided in one or more of the following subject areas: Global Economics, Risk, or Geographies. To see an interactive dashboard with comprehensive information about a specific country, click the Geography link of the navigation bar and enter a country name into the search box. The IHS Data Browser organizes and displays Risk Rating and Global Economy data. Build reports by choosing from a detailed list of strategic or sovereign risk factors, or view economic indicators over time. The data can be exported to Excel by clicking the Export button. View IHS Connect’s online help center by clicking the question mark icon on the main navigation bar. Download the PDF user guide or view it online. User guides for a variety of in-depth tutorial information are also available. In-person assistance is available from Bentley librarians; our contact information and Reference Desk hours are available on the Bentley Library Research Help page. Please visit our Databases A-Z page and click IHS Connect to begin your search. This database can also be viewed in the following Subject lists on the A-Z page: Country Research; Economics; International Business; Politics and Government. Are you curious about the “world” of resources that the Library offers? Visit the Library lobby all week to see a pop-up display of books and movies from across the globe! We’ll also provide search tips on how to discover new favorite titles by searching for diverse writers and filmmakers. Do you already have a favorite book or movie from a diverse voice or place that’s not in our collection? Let us know by placing a title into our suggestion box, and we’ll consider adding it. If you can’t make it to the library, you can submit suggestions via Twitter or Instagram using the hashtag #BentleyLibraryWishlist, post your suggestions on Facebook, or comment here. We’ll also have a giant world map on display. While you’re browsing the books and movies, take a moment to pinpoint the location where you or your ancestors come from, and check out the diversity of our Bentley community. Happy reading, searching, and pinning! Visit anytime during our open hours! Oxford Art Online is a comprehensive art research database comprising encyclopedias, dictionaries, images, and articles written by art history and research experts. The database contains more than 1,500 thumbnail art images, with links to searchable image databases and art images on museum and gallery web sites around the world. Users may view a full alphabetical listing of all available articles and images by choosing All Content from the browse bar at the top of the home page. Select Biographies, Subject Entries, or Images to browse specific types of content. A basic search box for keyword searching is provided at the top of the page. Users can also take advantage of the database’s Advanced Search capabilities, including specifying category searches such as time period, art style or geography. Advanced Search indexes for images, biographies, and bibliographies enable users to narrow searches to particular types of materials. Users can also refer to Subject Guides that compile available database content for specific topics. Selected topics are shown below. Search results can be printed and/or emailed for later use. In addition, the database provides copy-and-paste citations in MLA and Chicago formats, and citation export to RefWorks or other bibliographic management software. Online Guided Tours (video guides) and tips for searching/browsing are provided. In addition, a full help document may be viewed and/or printed. Please visit our Databases A-Z page and click Oxford Art Online to begin your search. On Display: Words Have Power – Read a Banned Book! In 2016, 323 book challenges were recorded in the United States by the American Library Association. (It is worth noting that many challenges go unreported.) The majority of challenges occurred against materials found in public and school libraries, and were most commonly brought by parents and public library users. The most common reasons for book challenges are: sexually explicit subject matter, offensive language, and religious viewpoint. ALA does not track international challenges, but history records many instances in which books have been censored and/or suppressed based on political viewpoint and other reasons deemed offensive to the state or nation. In conjunction with Banned Books Week 2017 and through the month of October/beginning of November, we’ve provided a selection of fiction titles that have been reported as challenged and/or banned by public libraries, school libraries, and countries. Also included are some nonfiction titles on censorship topics. Stop by to take a look at the books on display or view them online (and place holds on anything you’d like to check out). Books on display each contain a banned-books-themed bookmark, which readers are welcome to keep. We’ve also made some buttons which are free for the taking. If you use our OverDrive Downloadable Books , a list of banned and challenged books appears when you log into that collection. 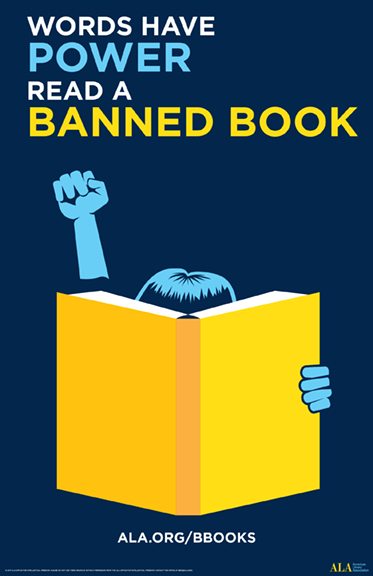 Exercise your freedom to seek and express ideas- read a banned book!